In 2011 I launched the non-profit start-up Organic Standard. The goal of the organisation was to create small and medium scale composting and manure treatment projects that incorporate the use of biochar to make agricultural soils ultra fertile. Fertile soils are an enormous carbon sink. It was the vision of Organic Standard to empower Swiss farmers to participate in the Swiss Voluntary Carbon Market in order to make it financially viable to implement a farming method that has been used in agriculture for thousands of years by the Indios of South America, where they used biochar to create the world’s most fertile soils – Terra Preta. Biochar is a stable form of carbon that helps the soil retain nutrients and water. With modern biochar production technologies, Swiss soils could be turned into Terra Preta within decades instead of millennia. As part of the non-profit start-up Organic Standard that I launched in 2011, we initiated 5 pilot projects running from August 2012 to October 2013. 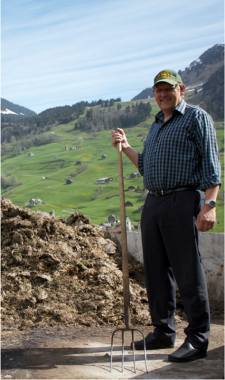 The goal of the projects was to optimise the use of biochar and saukerkraut juice in animal husbandry on Swiss farms. These projects were designed to improve the practical logistics of biochar and sauerkraut juice use and gather scientific data about the implementation of biochar and sauerkraut juice use in animal husbandry. Out of these pilot projects, a student, Marc Nyfenegger, at the Zurich University of Applied Sciences ZHAW did a research thesis, examining the influence of sauerkraut juice and biochar on the nitrogen metabolism of cow manure. The thesis was very insightful for further projects such as the Agro Klima Plus and the EU Project 2013 - Biochar in Cattle Farming. Our projects managed to win several awards, including the runner-up ward for the 2012 WWF Fellowship for Biodiversity and Resource Efficiency and the 1st place at the 2012 Falling Walls Conference in Berlin.